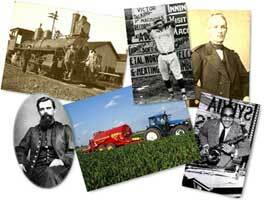 Western Illinois University Libraries is proud to present this database of historic images from the west central Illinois region. All images are fully catalogued and completely searchable by keyword, making the database an invaluable resource for researchers of all levels interested in learning more about west central Illinois. Images in this database come from all corners of the WIU Archives and Special Collections sixteen county collection area, with a special emphasis placed upon Western Illinois University, the City of Macomb, and McDonough County. Professional prints and digital copies are available at competitive rates. For questions, comments, or more information about the database, please phone (309) 298-2717 or send email to Library-Archives@wiu.edu. ©2003-2007 Western Illinois University. All Rights Reserved. Images may be protected by copyright. Do not copy or redistribute in any form without permission.